Given my preference for gorgeous, colorful, local produce, I’m embarrassed to admit that it took me over a year to walk into Urban Agrarian. I heard about it tangentially through a friend, but didn’t investigate it further. Why? The word “boutique” had been used to describe it. I’m going to be honest, I thought it sounded like the kind of store that would bust my weekly grocery budget. I didn’t realize where it was located either. If I had realized it was in the Old Farmers Market District, I might have come to the conclusion that I was terribly wrong about the kind of operation being run out of it. Perhaps if I hadn’t been so quick to write it off as another “pretentious” grocery store, I would have been enjoying the perks of shopping there a lot sooner. It’s not that lower-to-middle class incomes can’t purchase local food, but there is a sort of “boutique” mentality about who can afford to stock their entire pantry with these basic life staples. Readers, I’m not going to misrepresent and tell you I’m “upper-middle class” rich. I don’t live in Nichols Hills or in the up and coming condos and townhouses of downtown Oklahoma City. I’m an editor and a writer at an independent web magazine, not an engineer in the thriving energy sector. My company is not getting massive tax cuts and incentives from the state just for doing business here. I might be in the “creative class” that OKC is hoping to attract more of, but I’m on the more underfunded end of that spectrum. So being your average shmoe with college loans to repay, kids to provide for, car payments, and mortgage too, I’m not going to lie, Native Roots is more often than not too expensive for me to shop at regularly. Although I do appreciate the discounts offered with the Keep it Local OK card. And even if I were making 350k a year, I’d still think Whole Foods is pretentious “status grocery store” shopping. So imagine my surprise to discover that the open air market I drove past in Midtown all last year had been hosted by Urban Agrarian too. In passing, I remember seeing many kinds of people browsing the produce and the tables. The combined efforts of a few don’t go unrecognized, no matter how full of misconceptions this writer might be. So colorful. 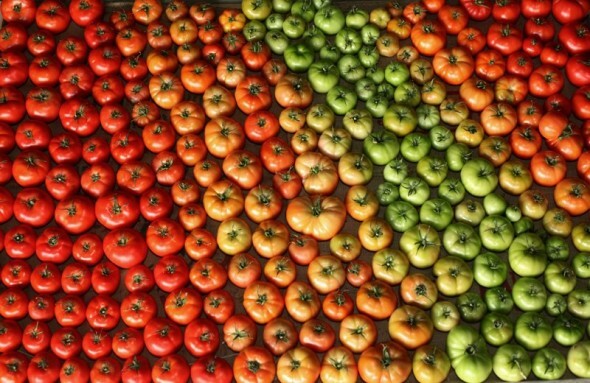 Photo by Urban Agrarian. 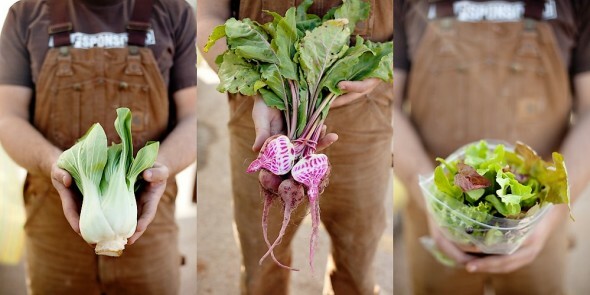 I spoke with Urban Agrarian’s founder, Matthew Burch, about his store and the initiative behind Spring Fest. I was surprised to learn that Burch started Urban Agrarian in his garage 5 years ago. Eventually he moved into the very building the Oklahoma Food Co-Op had been operating out of, that is until they got a deal through a friend of a friend’s father on a ten year lease. The building they are in now has been heavily refurbished. Burch said when they first moved in, there was nothing to the place but lights and flooring. After a few loans from family and friends, they constructed walls, racks, shelves, and installed plumbing and kitchen equipment. Much of their building materials had been reclaimed from preexisting structures slated for demolition. Their business office’s windows came from the building where chef April Harrington, founder of Earth Elements Kitchen, had been working in before an eminent domain seizure from the City of Purcell shut down her space. Harrington now shares a prep kitchen with Urban Agrarian. Her line of frozen meals can also be purchased there. Remember how I was complaining about affordability? According to operations manager, Shiloh Kile, about 5% of their customers use an EBT (food stamps) card. She’d like to see the number go up, but said it comes down to getting the word out that they accept food stamps. For those of us not using food stamps, there is the Keep it Local OK option. Kile said about 65% of their customers use it, and that in a 2 week time span they probably sell about 35 Keep it Local cards on average. 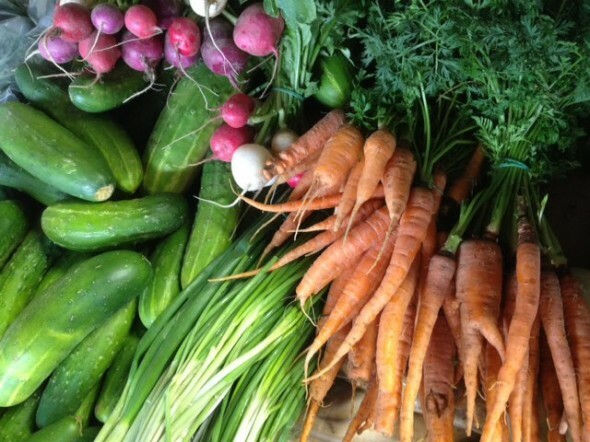 The Keep it Local OK card nets holders a discount on 10% off all produce, Flying L Beef, Briarberry Granola, and fresh baked bread from Prairie Thunder Bakery. 5 for $25 on frozen organic pasta from Della Terra Fine Pasta. 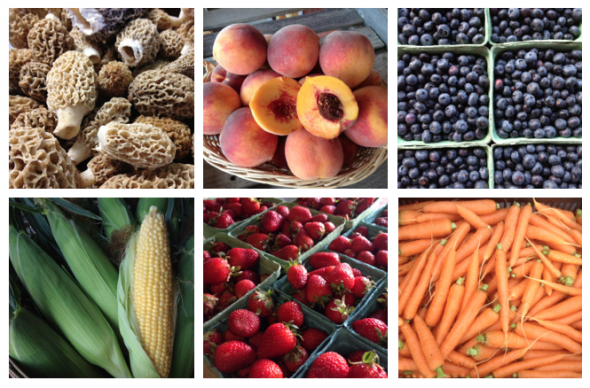 If you want to check out Urban Agrarian, there is no better time than this Sunday. On April 21st, which coincides with Earth Day all of the Old Farmers Market District will be transformed into one big party. Music, food, antiques and a special appearance from Ed Shadid are on the docket. Shadid plans to read an Environmental Proclamation for the Market District. It is worth noting that this place has seen a lot of change and urban renewal in the past year. Better Block OKC has been helped to tear down dilapidated fencing and providing advice on revitalizing the area. Anyway, here’s the 411 form Matthew Burch about the event. okc.net: What exactly Spring Fest? Burch: Spring Fest is an annual celebration of Earth Day and the spring growing season. It includes a seed & plant exchange, live music, vendor booths, live animals, food trucks, a local food market, antique tractor show, children’s activities, and outdoor bar serving local beers and cocktails. okc.net: Who is responsible for it? Burch: This event is hosted by the Oklahoma City Farmers Market District. The organizers are: OKC Farmers Public Market, The Oklahoma Farm & Food Alliance, Earth to Urban Local Food Hub (Urban Agrarian & Earth Elements shared facility), and the Oklahoma Food Cooperative. This year’s sponsors are: Smart Car, Fertile Ground, IPermie, Keep It Local OK, Clear Channel Communications, Hiersche Law Firm, the Oklahoma Gazette, International Association of Firefighters Local 157, and Southwest Laborers District Council. okc.net: How long has it been going on? Burch: Last fall we had our inaugural Fall Fest. This entire district was built in 1928, but has been ignored and fallen into disrepair for the past 30 or so years. 10 years ago Burt and Jody McAnally purchased the Farmers Public Market building and began to restore and renovate. 2 years ago we signed the lease and began building the Earth to Urban Local Food Hub with the intention of being an anchor for the restoration of the district. Spring Fest and Fall Fest will be annual events in the area which celebrate 2 very important times in the cycle of food production. okc.net: What is different about this year’s event, if anything? Burch: Last year we only had the Fall Fest, so we will have a modified set of activities. And there will be different seasonal foods highlighted. Another big difference about the Spring Fest compared to last year’s event is that we got sponsorship. Last year the entire event was funded from the pockets of the District stakeholders. Now we have improved marketing funds, a better budget for the food service, and outside support helping us to optimize the experience for everyone who attends. okc.net: What do you aim to accomplish by holding it? Burch: To show this City that the District is coming back to life. We want to be a place for food, market, and community. This event will emphasize all three of those aspects and we hope to be embraced by the metro residents who value our goals and vision. In only a few short weeks after Spring Fest we will be hosting the annual Better Block OKC event which aims to “build a better OKC block by block”. We want to showcase what we can do now and spark the imagination of others who could help us grow into our future potential. okc.net: How well attended is it? Burch: In the fall we estimated a turnout of 1500 people. For this event we expect to double that attendance and wouldn’t be surprised if it went beyond 3000.
okc.net: What haven’t I asked you that you feel is important that people know about Urban Agrarian or any of the vendors and artists associated with event? Burch: With all of the interest and popularity surrounding the concept of local food we want people to be able to differentiate what we mean when we use the phrase. With us, it goes beyond local ownership. When we talk about local food we are referencing not only that we are local, independent operators but also that we are a place to find food grown, raised, and made in Oklahoma soil, on Oklahoma ranches, by Oklahoman hands. Earth Day/Spring Fest starts at 11 a.m. and runs till 5 p.m. Check the website for more details. 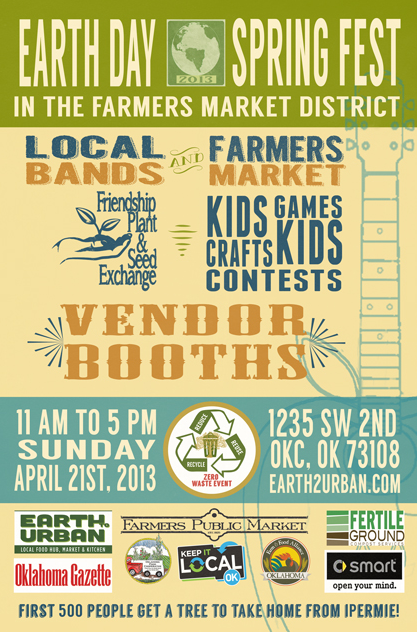 Tagged 30, activities, Burch Last, Earth Day, Fall Fest, Keep It Local OK, Matthew Burch, music, Native Roots, OKC, okc.net, Oklahoma City, Old Farmers Market District, produce, Spring Fest, Urban Agrarian, Whole Foods. Bookmark the permalink.